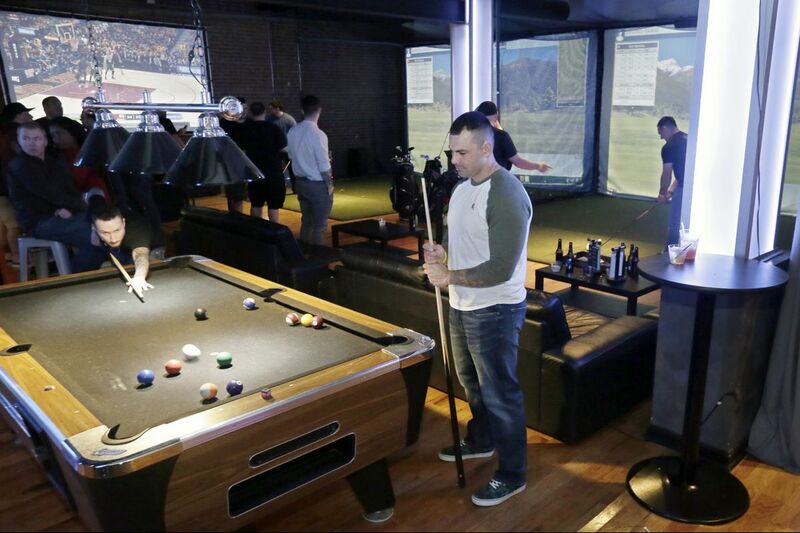 Some folks choose billiards while others use the golf simulators or watch the NBA playoffs upstairs at Golf & Social. I wince as my golf ball ricochets off one of the landmark stone structures on the iconic St. Andrews Old Course. But, thankfully, no angry Scotsman comes running to curse me. It turns out that if, like me, you have the hand-eye coordination of a loosely blindfolded toddler, the optimal way to play at this hallowed birthplace of golf requires no air travel whatsoever. Instead, it’s best to remain right here in Philly and head to Golf & Social, a six-month-old Delaware Avenue sports bar. Owner Richard Troost, an avid golfer who’s worked in the tech sector for 20 years, said he was inspired after practicing on a simulator improved his own game dramatically. "I think it's more fun than bowling," he said, "so I figured it could be the next thing to do." He opened his first location, a BYOB in a Marlton warehouse, a few years ago, then closed that and upgraded to the Philadelphia location, which includes a sports bar on the ground floor, golf simulators upstairs, and, planned starting in June, a rooftop bar with a beach-club vibe, complete with cabanas. It feels like an instant bachelor party destination, not to mention a no-brainer Father's Day gift. In other words, I am not the target demographic here. I know little about golf, though I hear it’s a good walk spoiled — and, with simulators, there’s not even walking. Lauren Attanasio (left) and Liz Giunta of Philly don’t even play golf, but while attending a birthday party at the club, they enjoy the golf simulators upstairs at Golf & Social. I compensate by bringing a golf fan, Patrick. We start at the sports bar — where cocktails include the Shooter McGavin pear-apple martini and the John Daly, an alcoholic take on the Arnold Palmer. I try the Judge Smails Old-Fashioned ($9), an enjoyable Bulleit bourbon concoction that would have been even better without the grit of undissolved sugar at the bottom. The beer list hits predictable but welcome notes: $4 Bud Light, but also local IPAs, like Dogfish Head 60 Minute and Troegs Perpetual ($7). The food menu tends toward wings, cheesesteak egg rolls, and sliders. Then we venture upstairs. For a minute, we wonder whether the dim, echoing space is even open. Then, a young man’s head pops over the back of a couch where he’s been watching an action movie on the large screen. He squints at us, seemingly disoriented. “You know it’s $55 an hour, right?” he says. (In fact, it’s Wednesday, so golf is half-price.) He slouches over to a screen, gives a desultory demonstration, and then disappears back into the couch. Golf & Social on Delaware Avenue. Once we get going, there are apparent advantages over the real St. Andrews: I'm able to watch the NBA playoffs, order another round of drinks, and lounge on comfortable leather sofas in between shanking balls toward a large screen, where, in my case, they appear to land in various sand pits, babbling creeks, and high bushes. Playing nine holes takes only about half an hour. And there is no one playing behind us to grow impatient, or to judge when my arms get tired and I make Patrick take my turns. Plus, it's climate-controlled (theoretically, at least — though I'd recommend dressing in warm layers, as it was frigid on my visit). Patrick was a little disappointed — but not me. By the time I got to the final putting green, I was quite ready to turn in my clubs. Snoh Jebboe of Philadelphia wears Silent Philly headphones (bargoers can pick from three types of music) at the downstairs bar at Golf & Social. When to go: Wednesdays! Golf is half-price then. Otherwise, it's $55 per player for 18 holes, or $30 per player for nine holes. It's open 10 a.m.-2 a.m. daily. Bring: Your dad. Your best man. Your golf instructor. Or call ahead to book a session with one of the bar's pros. Order: Try one of the more than 50 tequilas, or stick to the beer list. The tater tots ($4.50 and up) are available with a range of toppings, including tot-nachos made, inexplicably, with ranch dressing. They come in a portion that, by my estimation, could feed a family of four for week. Bathroom situation: Very clean, single-stall units upstairs; similarly spotless multiunit restrooms below. Sounds like: A chill soundtrack of Eric Clapton and Rolling Stones, or, during major sporting events, a booming 97 decibels of sound from the flat screens showing the game.